Often described as one of the most exotic, lush and breathtaking places in Guatemala. Often described as one of the most exotic, lush and breathtaking places in Guatemala, Semuc Champey is a natural monument in the municipality of Alta Verapaz, near the Q’eqchi’ Maya town of Lanquín. Semuc Champey, which means, “Where the river hides under the earth” in Q’eqchi’, consists of a 300 meter wide natural limestone bridge, under which passes the Cahabon River. A true piece of jungle paradise. The Semuc Champey clear pools of water are an invigorating and magnificent mixture of aquamarine green pools and small waterfalls, perfect for swimming and relaxation. Some areas are deep enough to dive into, from points on the limestone shelf. There are fish happy to clean your feet, invigorating waterfalls to hang out underneath and even smooth rock waterslides! The limestones have little caves too, which you can swim into and look out from, underneath the waterfall. Entering the town of Lanquín, the national monument of Semuc Champey is a rugged and winding 40 minute truck ride into the jungle. On the ride in, you will be rewarded with a spectacular view of the scenery all around you. You’ll immediately realize why the effort of reaching this remote area is well worth it. 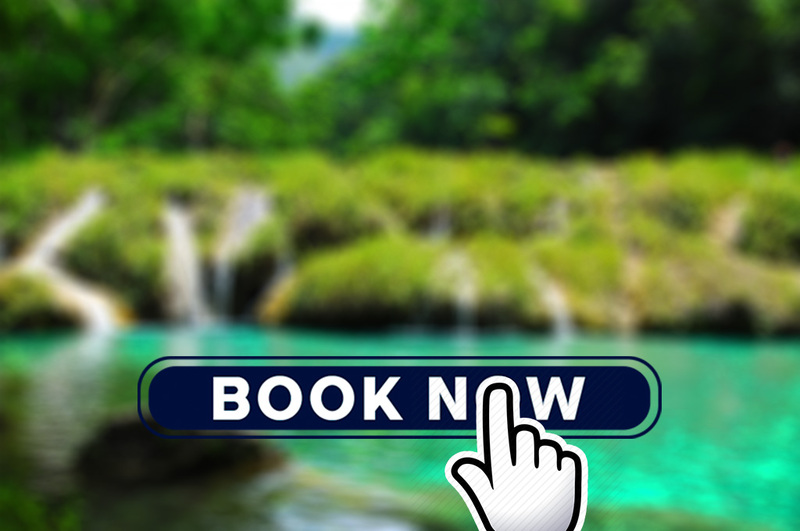 The tour starts with a visit to Semuc Champey, where you can view the natural limestone pools, filled with fresh, clear spring water, which comes from the surrounding mountains. You will then have the opportunity to swim in the turquoise and emerald-green water. From there, we continue to visit the caves of Lanquín. These caves are so called Kamba Caves; dry caves with a little river running through its interiors. There are many interesting stalactites to be found, and one of the highlights of the visit to these caves is the thousands bats flying out from the cavern at dusk. The Río Lanquín flows out of this cave. We will also visit the beautiful waterfalls of Lanquín which are surrounded by a natural cloud forest.